Earlier this week we wrote Part I of II on How To Be A Gentleman. Some lads, young and old, might need an extra tip to point them in the direction towards manly and gentlemanly behavior. Fret not, if you want to carry yourself in a well-regarded fashion, these finer points are for you. 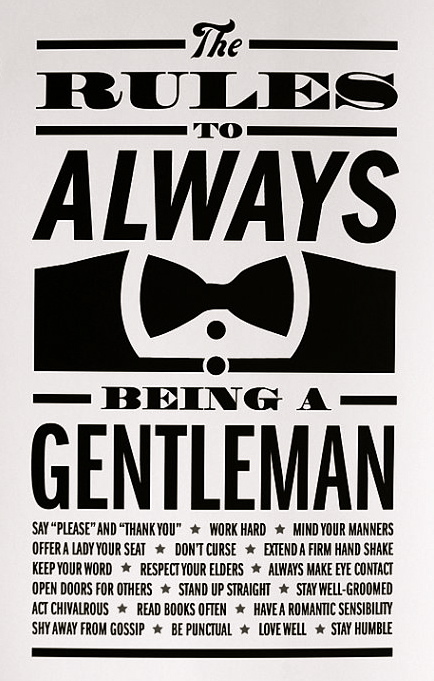 Check out the first 11 points on How To Be A Gentleman here. Being a gentleman isn’t a pompous attitude or expensive clothes. Nor is it suave talk and standing tall. It’s the best mix of your character, treating others well, and presenting yourself as a man others want to follow. This is the essence of how to be a gentleman. When learning how to be a gentleman, it’s less about “me” or “I”. It’s about others. Them. Carrying yourself in a way that esteems others will earn you esteem. Want to stand out? Speak well of others in their presence, and away from them as well. People will take note. The man who can give specific and exacting praise is worthy of receiving it himself. Again, learning how to be a gentleman is about others. Growing your listening skills is paramount to being regarded as a gentleman. But learning to ask great questions that draw a person out of their shell is important as well. Art of Manliness did a great series last year on polishing up on your listening skills: How to Listen Effectively. Everyone loves a good story teller. And just because I suggest you guide conversation by asking people about them, rather than talking about you, doesn’t mean you should be a hard nut to crack. People love good stories that share some adventure, and insight about who you are. Know what stories about yourself people are most interested in. When telling a story, remember that you’re not telling your life story. Share stories that have a point and an end. Have you ever felt trapped in a conversation with someone telling a story that really wasn’t a story? They weren’t actually even talking with you, they were talking at you? That’s a person telling a story with no point or purpose. I’m guilty of this. And I sometimes wonder if we do it for our own catharsis–to process aloud with someone in the hopes of “feeling better”. It’s cool to do that with your therapist or close friend, but don’t use the random stranger at a party to have a cathartic moment. Be a gentleman! Now onto how to be a gentleman in how you carry yourself. No man wants to be regarded as a slouch. Standing up firm and strong isn’t just good for your health, but good for your confidence. There really is a physical/mental connection with posture. And people can see it. A person cowering or hunched is viewed as weak. A man who stands tall is regarded as having confidence. Pay attention to your posture, and stand up straight. And I don’t remember who that charming young lad was. Nor do I remember anyone thinking he was the sharpest dressing gentleman out there either. Gross. Wash your clothes. Clean stains–including the collar of your neck. And iron those shirts man! Be a gentleman! Wildstallion1999@hotmail.com isn’t the way to present yourself when applying for a job. It’s also not the most savvy way to interact with new friends. Being sharp and looking on your game sometimes takes putting away some childish things. Go ahead and keep your fave teenage email address, but for those people you’re aiming to be a gentleman around, keep it classy. A man’s online social profile reaches far and wide. When potential employers want to know more about you, do not doubt that it’s likely they’ll look you up on your favorite social network. Having a goofy profile picture with your family is great. But looking like a drunken sailor or a Jersey-licious club rat won’t score you extra points with the classy young lady you want to pursue, or those that you want to recognize you as being a gentleman. Being a gentleman requires your yes meaning yes, and your no being no. When you tell someone you’re going to do something–do it. Even when it costs you. I’m an absolute hypocrite on this point. My handwriting has not changed since 6th grade. Considering I barely handwrite anymore, considering all the tech we use, my scribbles are probably in severe decline. It is so bad more than once I’ve asked an assistant to handwrite a post-it note to the president of my organization so I wouldn’t have to hand him something illegible. Thinking about it still makes me smirk today (Sarah!) but probably isn’t the most gentlemanly practice. If you’re in my bad-handwriting club, there are penmanship courses out there that’ll help us improve, and I for one could use this lesson in how to be a gentleman. On that note, have you evaluated your signature lately? I’m not the most savvy when it comes to perfect etiquette. What side of your plate does the big fork go on? How do I tie a cummerbund? How do you impress really old rich people?? What I do try to pay attention to is being accommodating. If you’re with people you’re familiar with, be warm to the new persons and make them feel included. Are you around a new group of people? Don’t pull out your latest gag routine. Keep things simple until you’ve figured out the the personalized subculture of the group you are hanging with. Find out what’s important to them, what behavior is appropriate to the situation, and present yourself in the best light. I hope it’d be needless to say, but belching in front of ladies you want to show respect rarely garners you some. Using words like “Excuse me” and “Thank you” go a long way. Ask before taking. And instead of ordering someone to do something, ask them if they’ll do you a favor. On a note that I’m sure any restaurant servers out there will appreciate, showing kindness to those in any service industry will distinguish you. But don’t do it to be distinguished. Show kindness and patience to those making your coffee, serving your food, installing your cable, or fixing your car. People who are adamant and demanding they get their way almost always sound like alpha-douches. Or large babies. Instead of being pushy and consistently trying to get what you want, concede to what others want. Nothing spoils chilling with a group of people more than the whiner who’s only going to be happy if the crowd does what they want. If that’s ever been you, take note. I guarantee people remember that moment you had to have your way. It’s easy for any of us to be forgetful. And it’s easy to forgive ourselves when we are. When others are forgetful? We’re not so merciful. Show others you care by remembering not only the big things–but the little things. Doing this at your workplace as well will only help your touted reputation as knowing how to be a gentleman. If you’re chief love language isn’t giving of gifts and connecting with people through acts of service, it will take repeated mental note-taking to give more effort in this area. But few things shout “gentleman” more than a thoughtful note or gift to a lady love or friend. Whether it’s a special occasion or they need a pick-me-up. Don’t neglect to think about your bros too. If a buddy is down, make sure to be there to cheer them up. You can get them some gentleman gifts as well. If you’re a house guest or someone recently helped you relocate, be thoughtful and give them a gift. The list could go on and on. There are an infinite number of ways to carry ourselves well and to learn how to be a gentleman. We’ll most certainly continue to talk about it on the site. Any thoughts from you to sharpen other guys and help them carry themselves with class? Get the full story–take a look at How to Be a Gentleman Part I. Great list Todd! Get a grown up email address, made me laugh, but very true. Haha I’m glad you commented on that! I was going to edit it this morning and cut that and the social media point. I was thinking the article was too long and wanted to cut some fluff! “Being a gentleman requires your yes meaning yes, and your no being no. When you tell someone you’re going to do something–do it. Even when it costs you.” AMEN! Could not agree more Todd. Great post series! Thanks John! I’m sure we’ll put together a part III eventually!! Let me know of other well needed lessons aspiring gents need to hear!! Hey, Cheryl fell in love with me because my email address was greatinthesack@yeahbaby.com, but if this is your way of telling me that wildstallion1999@hotmail.com is now available, I’m all over it. Joking aside, these are too often forgotten by young men today. My daughter was introducing us to a new boyfriend. As he was leaving (without saying goodbye to anyone but Autumn), I said, “Thanks for hanging out with us today. It was nice meeting you.” His answer? “Yeah, no problem.” Not the correct response. Learn some basics (as you have listed here) and you’ll go far…..
Ha it’s funny you point that out. Years ago I took the email addresses thegreatestlookingmanofalltime@gmail and something else similar. I don’t even know why! I never used them and can only guess the password. “Yeah, no problem.” As if he did YOU a favor!! I hope this boy is still a teenager…maybe you could give him some coaching?? I have a cousin who has teenage daughters. This is in Kentucky, so keep that in mind. He has a very long knife that he makes a point to get out and sharpen if a young man happens along. Keep them afraid! Ha hilarious. When I was 21 I dated a girl (20) who’s dad really did not like me. When she wasn’t around he asked me once how I felt about him just getting out of prison. It was maybe the worst question I’ve been asked in my life. Awesome tips Todd, and thanks for including the tip I mentioned. I believe listening skills are a lot of what makes people interesting. Thanks. For sure! Glad you shared your thoughts. Great list. As a woman, I appreciate these traits. Too often these are forgotten qualities that seem to be lost on the current generation. Good post. Thank you! Are there any that you would add? Man, this is a great list! I think keeping your word is extremely important. If you’re not a man of your word, then you aren’t much of anything. I’m totally with Chris and his comment as well. I enjoy learning about others and prefer not to talk much about myself. Frankly, I think it’s annoying to talk about myself and would much prefer to be the one asking questions and getting the other person to talk. I agree! I feel weird when people are pulling out of me long personal stories. I feel as if I’m giving to much away. I suppose that might actually be a sign of insecurity, of losing “power”. But I do much prefer to be a giver and a listener. I find that holding the door for someone….anyone, not just ladies makes a world of difference! If you go through a door and someone behind you is within say….15 feet of coming through behind you, hold the door for them. Good call. Growing up that didn’t seem to be a common practice in Northern California. But it seems to be making a resurgence in SoCal! I like your point about getting trapped by someone telling a you long story and just can’t stop talking. I have a “friend” who could go for hours, if I let him. My solution is wait for him to take a breath of air and I quickly say “time for me to get going.” Then make a hasty getaway before he can start on his next endless story. Ha it’s funny you mention that. Whenever I get tracked in the same situation, I always regret it when I DON’T scoot out when I saw the chance, and I end up having to drag through another 10 minutes of story-telling. Another thing I think is important, which kind of goes along with both talking about their interests and the whole long stories that go nowhere, is to realize that your interests aren’t necessarily another persons interests. And what I mean by that is, generally, people don’t care about all the details of your latest projects and will want to bang their head against a wall as you give them a twenty minute, step by step run down of how you went fixed an issue you were having with your cars transmission, for example. Be mindful of the other person and try to keep it short, simple and interesting. Chances are that it is interesting to talk about, but if you give all the details in a lengthy explanation the conversation is going to turn into you talking the whole time and the other person wishing they were somewhere else. Just something to keep in mind.